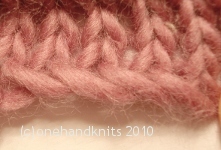 – simple, fast, loose, useful for adding additional stitches, such as over buttonholes, can be worked in either direction but not the neatest of edges. 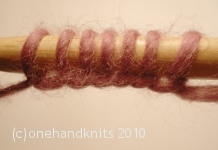 1.Hold the waste end yarn tail in either hand close with the needle. 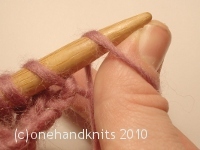 2.Hold the working yarn in your other hand so that it is taught. 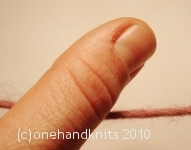 3.Using the thumb of the working yarn hand as a pivot push down on the yarn, hook your thumb underneath it and back up so that a loop is formed around your thumb (above = left thumb; below = right thumb). 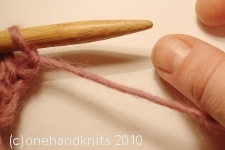 4.Keeping tight hold of both ends of the yarn place the needle tip into the loop held on your thumb moving the needle from left to right and front to back. 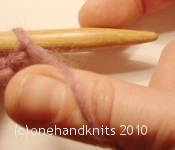 5.Slip the loop from your thumb to the needle and pull tight on the working yarn. 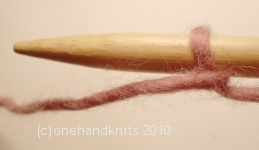 6.Repeat steps 3-5 until the desired number of stitches (st) are formed on the needle. 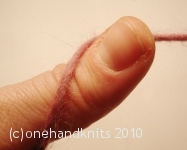 7.IF you held the needle in your RIGHT hand at the start you will need to turn it and transfer to your left hand keeping the waste yarn held tight at all times. 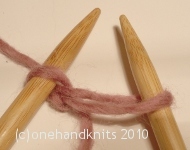 Purl into these st to produce the first wrong-side (WS) row of the piece. On the right side (RS), signified by the waste tail being on the right, you will have a row of twisted st. This method is best used when a loose cast-on is required, curling up is not a significant issue to the finished look, or where the finishing instructions include picking up and embellishing the hem later. 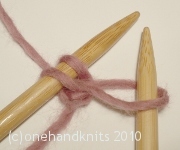 8.IF you held the needle in your LEFT hand to start then you can immediately knit into these stitches to produce or row of twisted st on the RS, signified this time by the waste tail being on the left. 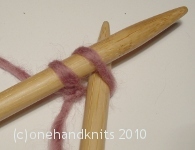 This is particularly useful when a number of additional stitches are required to be c/o at the beginning of a row. 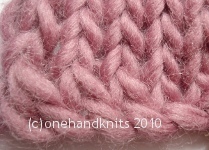 – basic, quick, easy to learn, more sparing of the yarn than fancier cast-ons, a little untidy and prone to curling up. 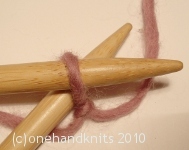 1.Make a slip-knot (SK) and place onto the left-hand (LH) needle. 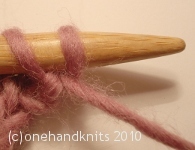 2.Holding the working yarn at the back, place the tip of the right-hand (RH) needle through the loop of the SK from left to right and front to back. 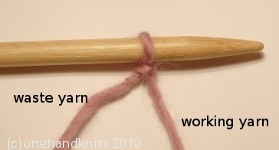 3.Wrap the working yarn clockwise (over-under if yarn held in LH/ under-over if yarn held in RH) around the tip of the RH needle and pull it through forming a new loop. 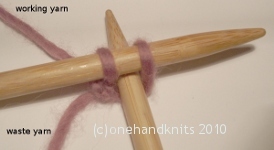 4.Place the new loop onto the LH needle to form a new stitch (st) such that the RH needle tip is positioned again from left to right and front to back within the st.
5.Repeat steps 3 & 4 until the desired number of cast-on st are positioned on the LH needle. 6.The RS is signified by the waste-yarn tail being on the left. – easy to do, quick, very neat, does not curl up, elasticated but can be a little tight, a good solid hem. 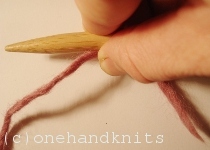 1.Follow steps 1-4 from the knitted cast-on OR form two backwards loops on the LH needle. 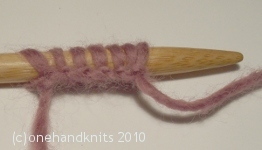 2.Remove the RH needle tip from the loop of the second st and insert it instead between the first and second st.
3.Wrap the yarn clockwise around the RH needle, draw the yarn through and place the new loop on the LH needle as above. 4.Repeat steps 2-3 until the desired number of st have been cast-on. 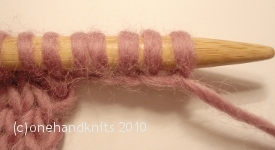 5.Purl these st to produce the first wrong-side (WS) row of the piece. The RS is signified by the waste-yarn tail being on the right. 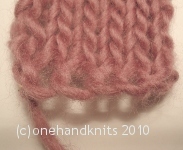 Photographs and text copyright (c)onehandknits 2010. Not for redistribution. 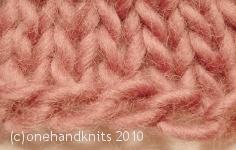 This entry was posted in Beginner, Knitting Tutorials and tagged backwards loop, beginner, cabled, cast on, expert, guidance, guide, how to, instruction, knit, knitted, knitting, learn, teach, teacher, tutor, tutorial. Bookmark the permalink.